Visualize, Query Convert – read all 3D Formats, Automated Repair and Conditioning, Viewing and Analysis Tools for Measurement and Mass Properties, Read PMI / MBD Data, Assembly Restructuring, Polygonal Reduction, Output to Polygonal and Neutral CAD Formats. Who’s A Good Fit For PRO? 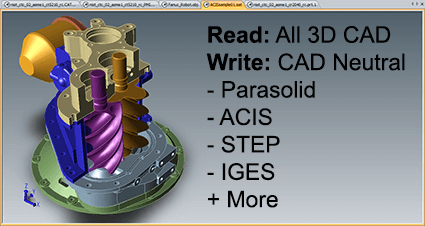 Designers and engineers who need the ability to Write neutral CAD formats such as STEP, IGES, Parasolid, ACIS and more. Jobshops who need native format output and want to replace full CAD seats with an easier, quicker and more cost-effective solution. SOLIDWORKS or Inventor users who want to take advantage of TransMagic’s additional CAD formats, as well as automatic repair tools from inside of their respective CAD applications. CATIA V4, V5, V6 (up to 2018/R28); CATIA xcgm; Pro/E (all); Creo (up to 5.0); NX/UG (up to NX12, 9.5 for PMI); SOLIDWORKS 97-2019; SolidEdge ST10; JT (up to 10.2); Inventor (up to 2019); AutoCAD (up to 2019); Microstation (up to V8); TransMagic (R7-R12); Parasolid (up to 31.0); ACIS (R1.5-R2019/R29); IGES (up to 5.3); STEP AP203/AP214/AP242; SMLib (all); VDA-FS; 3D PDF (up to 2018 SP2); 3D XML (up to R2016); STL; OBJ; PLY; U3D (EMCA-363); PRC; VRML 1.0/2.0; HOOPS (up to 20); Collada; POD; CGR (up to R2019/R29); Image formats (Tif, Png, Jpg, Bmp). TransMagic (R7-R12); Parasolid (up to 31.0); ACIS (R1.5-R2019/R29); IGES (up to 5.3); STEP AP203/AP214/AP242; SMLib (all); XCGM; VDA-FS; Ngrain (up to 6.0); 3D PDF (2018 SP2); 3D XML; STL; OBJ; PLY; HOOPS (up to 20); Collada; POD; U3D (ECMA-363); WebGL; 2D PDF; Image formats (Tif, Png, Jpg, Bmp). Multi CAD Translation with TransMagic from TransMagic Software on Vimeo. Best in class performers are ten times more likely to turn towards translation applications such as TransMagic to insulate themselves from the disruptive effects of recreating designs in different formats. In my 33 years as a Design Engineer and the last 5 years as a software evaluator of CAD, FEA and Dimensional Analysis programs, I have never experienced such a leap forward in my ability to perform my daily tasks. I am indebted to TransMagic for the marvelous translation interface. TransMagic was a real lifesaver on a job where I had to translate CATIA V4 files to Parasolid models to open in Unigraphics. I was going to keep TransMagic a secret from my engineering friends since they were all impressed that I was the only one who could get these files to work! But I told them it was easy with TransMagic. What’s in the SuperView Eval? Download a 7 day free trial of our product and feel the power at your fingertips - that no other CAD translation/viewer/comparison product on the market can touch. Use our simple PRODUCT WIZARD to select the options you need and we’ll select the product that best fits your needs.